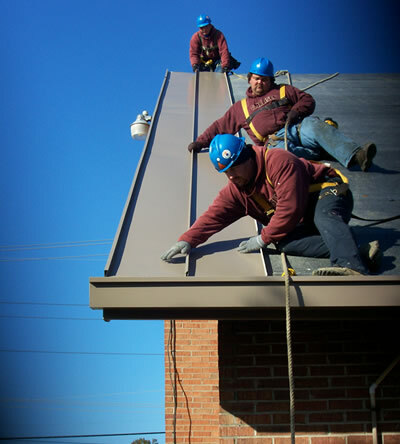 Kelley Brothers Roofing, Inc. is committed to the safety of our employees and individuals at our jobsites and office. We work very hard to identify all safety risks of each jobsite individually and then devise a safety plan in advance in an effort to avoid injury. We have a full time Safety Director and Safety Assistant that concentrate on evaluating the jobsites and training for the employees. Our Superintendents are also trained and current on all safety issues and are instructed to identify and correct all safety issues if any arise. All Foremen are OSHA 30 certified and evaluate their crews throughout the day to ensure safety compliance. Field Safety Assistants are assigned on all large projects. The responsibility of these individuals is to do a daily check of all equipment to determine if it is in safe, operational condition. Toolbox Talks are conducted once a week for on-the-spot training. The discussion topics normally relate to the current project or equipment in use, but can also be training on such topics as heat exhaustion, electrical awareness, and even preventive measures for insect bites. New Hire Orientation is conducted for all employees that are hired by KBR. We go through a comprehensive training program that includes several areas of concern including fall protection training and drug free workplace awareness training. Our employee training programs are ongoing throughout the year. Our goal is to make sure each and every KBR employee is OSH 10 certified. KBR is a proud member of the Advanced Drug Free Safety Program with Ohio Bureau of Workers’ Compensation. What this means is all of our employees are required to take a pre-employment drug screen as well as monthly randoms. And finally, once a quarter we bring all field employees into the office for our Quarterly Safety Meetings. During these meetings, all jobsites are shut down and the meetings are mandatory for all employees. These meetings may include some training, however the main purpose of the meetings is to review with the field crews what is being done correctly, safety-wise.